The roof above your head is often taken for granted. They are the first defense against the fury of the elements, and whether they are made of steel or ceramic shingles, they eventually wear down. Because the entire roof is literally and visually beyond reach most of the time, it is important as a homeowner to make roofing inspection and repair part of your regular maintenance schedule. “If you check the condition of your roof at least once a year, you should be able to plan in advance for necessary repairs. Early signs of trouble include dark areas on ceilings, peeling paint on the underside of roof overhangs, damp spots alongside fireplaces, and water stains on pipes venting the water heater or furnace. Detecting roofing damage is just the beginning. The next thing is to determine the cost. Simple cracks may require a little application of sealant, but sometimes, heavy duty work may be needed, such as with major leaks. For thorough Palo Alto roof repairs, licensed and established contractors, such as Shelton Roofing, can perform high quality professional repairs you don’t have to worry about in a long time. 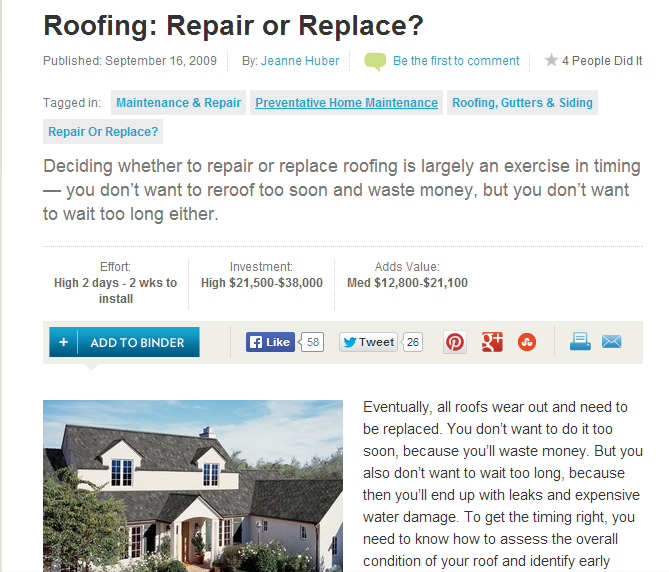 Many roofing contractors also provide energy-efficient materials for roof replacements. Though it is expensive, a roof replacement can be an opportunity for you to choose a more sustainable and cost-effective roofing material. A more energy-efficient roof that is fire- and hail-proof makes for an excellent upgrade. Homeowners should consult with their licensed contractor before deciding whether to repair or replace their damaged roofing.